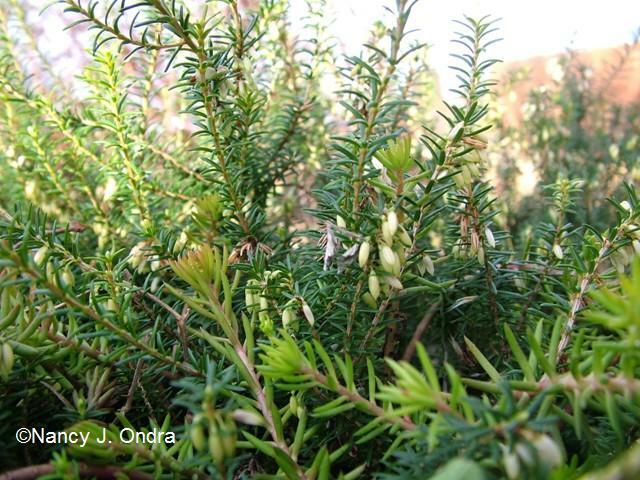 Yep, over here is good old ‘Golden Starlet’ heather (Erica carnea), which featured in all of my winter Bloom Day posts last year and which has been budded up since mid-October this year. Still, there aren’t many days when it’s comfortable to get low enough to get a good closeup. Here’s the view from normal height. ‘Angelina’ sedum (Sedum rupestre) always looks nice up close this time of year, even if the garden as a whole is weedy and waterlogged. 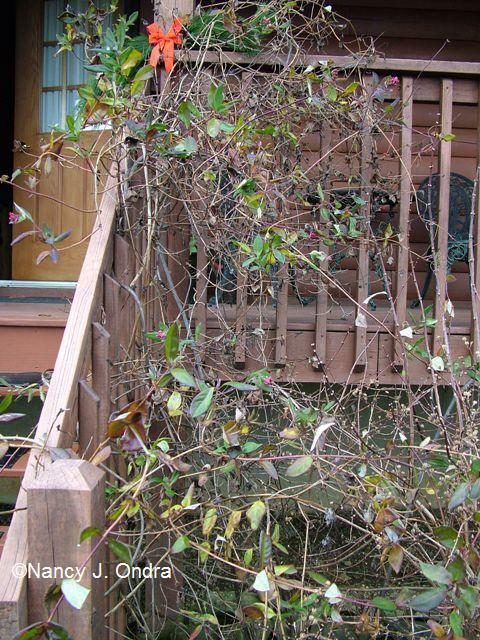 But it’s hard to see them, because I’m not about to cut back the foliage until mid- to late February. Even though the vines themselves are a mess. And it’s not too bad even from a few steps away. From the end of the path, though, it looks kind of scrappy, as does a nearby cardoon (Cynara cardunculus). The cardoon wants its closeup before we move on. 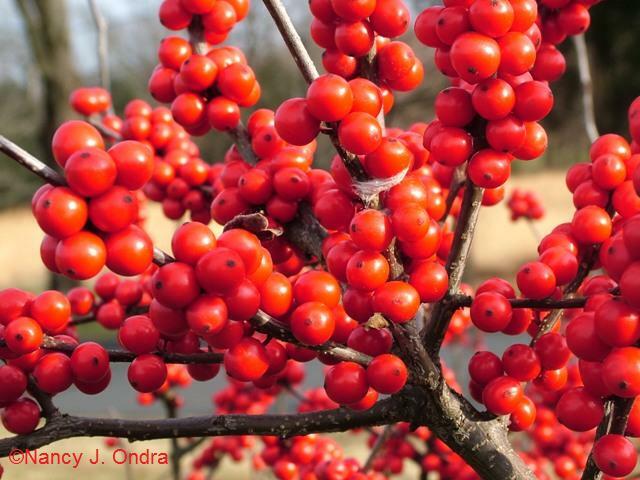 Out in the shrubbery, the ‘Winter Gold’ and ‘Winter Red’ winterberries (Ilex verticillata) are looking luscious. Or are they? Mmmm…maybe not so much. On the other hand, the ‘Bud’s Yellow’ dogwood (Cornus sericea) looks rather nice, even from a distance. But it’s even prettier up close. That’s a lot of color power for this time of year. I think I’m going to stop there, because I can’t do much better than that on this December Bloom Day. To see what’s looking good in other gardens around the world, visit Carol’s Bloom Day post at May Dreams Gardens. Nan, it is lovely to see Daniel and Duncan again, we haven’t seen them for a while (unless I missed a post, unlikely!). I love your idea of showing us beautiful close ups and then showing the larger view. I haven’t cut the leaves of my hellebores yet, I usually do it at the end of November but the wet weather has kept me out of the garden and I didn’t have time on the one fine weekend we have had. I have some lovely flowers on them which is earlier than usual. The boys say thanks, Sylvia. Usually they ignore me when I’m out with the camera, but there’s not much else to do this time of year, so watching me trying to come up with photos for this post gave them some entertainment, and I got a few cute pics of them in the process. Happy Bloom Day to you, Daniel and Duncan. I liked your approach this month of showing not only the close-up but also the garden view of each plant. Sommehow it’s comforting to see your garden is not exactly perfect – even though it’s always lovely and inspiring. Oh, it’s so very far from perfect that it’s not even funny. But it got me through yet another Bloom Day, so I shouldn’t complain. Thanks for visiting us, Debbie. I like the close ups and then the long view. We should all have Daniel and Duncan to keep us honest! I too like the closeups; not so crazy about the wider views. But using all closeups yet again would have been cheating, I think. Happy Bloom Day, Carol. I love seeing your precious animals. What sweet faces. Happy GBBD. Thanks, Lisa; I love seeing those faces too. We appreciate your visit! Thanks, Carol. It was nice of the deer to leave me a few berries for these photos, though you can see that the plants don’t make much of a show at this point. The boys, on the other hand, are eye-catching all year ’round. Hi Nan, I too love seeing your pets and pals. You are the only one who seems to have winter gold along with the reds. They are so worth seeking out. The cardoon is fabulous, we haven’t been able to get one going, maybe too hot and humid summers? Do you pick the leaves off the witch hazels? Silly question, you probably do not, but they seem to be hanging on moreso than other years and my fingers are itchy to do something constructive in the garden on nicer days. Not a silly question about the witch hazel! More of the leaves will drop off over the next two months, but there are always some left by late winter, so yes, I do eventually pick them off. It’s not a big deal, because you can see the plant is still just a few feet tall. It’s been in that spot for six or seven years now, but it was only an 8-inch, single-stemmed twig at planting time, so it’s made some progress. 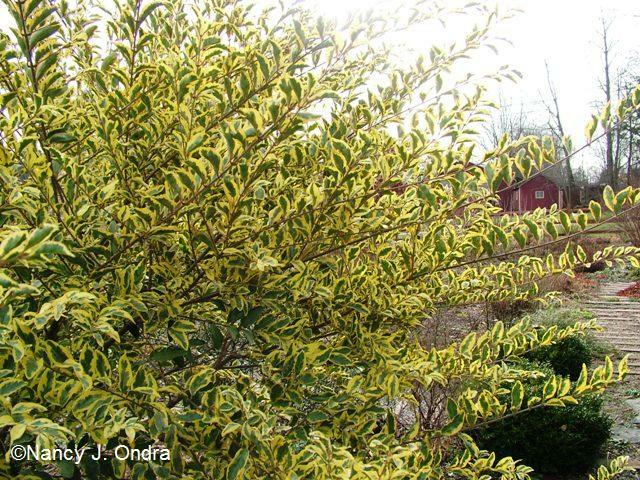 I so appreciate the longer shots Nan~~especially of the witch hazel…I have H intermedia x Diane. A beautiful flower, but the for some reason this one holds onto the leaves until after it blooms. Isn’t that a shame! Love Bud’s Dogwood~~They must be stunning after a nice snowfall. Cheekwood (our botanical garden) has a mass planting that looks fantastic even without snow. Have a great day out there! gail Daniel and Duncan are nice bookends for your post. ‘Bud’s Yellow’ has been a winner for me too. Its foliage is plain green, and each year the dogwood sawflies chew it to bits, but on the plus side, it doesn’t seem to be bothered by the diseases that have foiled my efforts to grow the red-stemmed kinds. The winterberries look great! I wish I could claim that we have a hellebore bloom but ours have done very little. 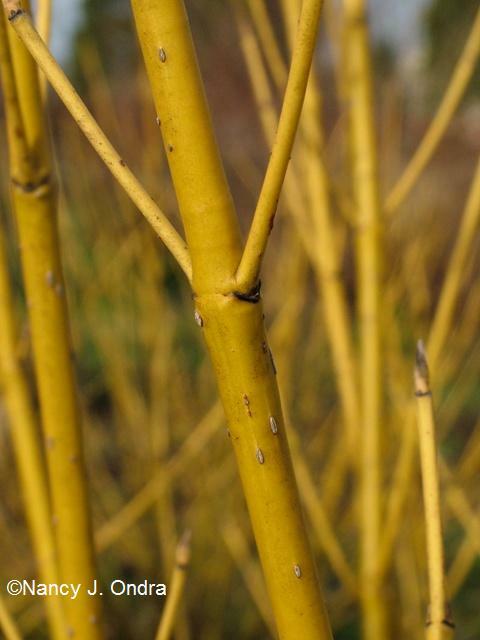 The ‘Buds Yellow’ Dogwood look very cool too! Hey there, Dave. 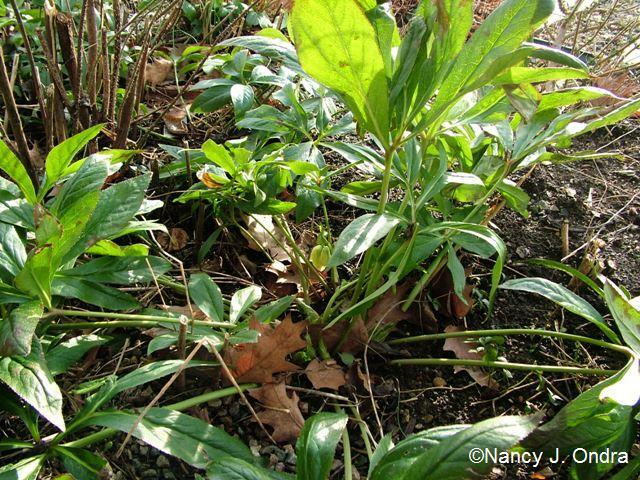 If memory serves, your hellebores start for real a few weeks earlier than mine do, so it won’t be too long until you have blooms of your own – maybe in time for the February Bloom Day. But what are we going to do for January? Gads, Nan, I fear I look like Daniel myself about now. What an expression! 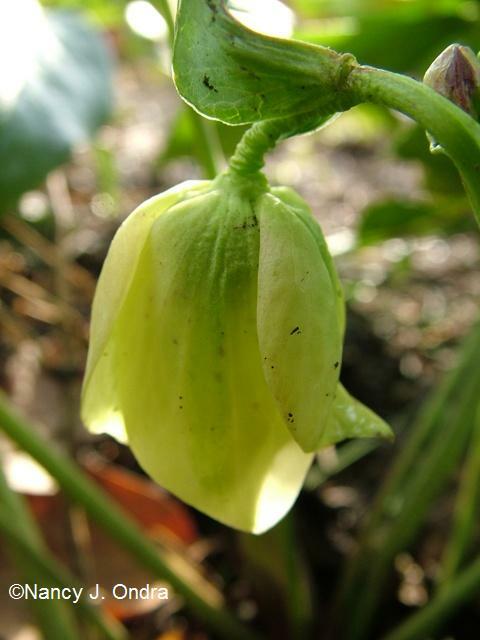 I’m going to have to rush out now and see if any of my hellebores have produced buds or blooms. 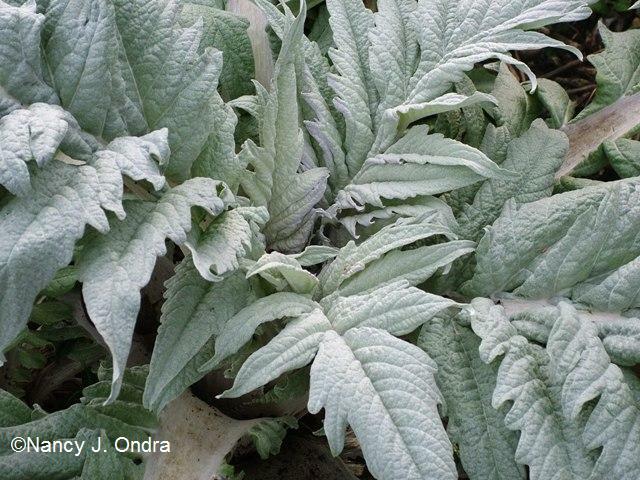 And your cardoon foliage looks so much like the foliage of the ‘Violetta’ artichokes you gave me, cozily growing among all the potted plants in the in-ground greenhouse bed. It’s a good reminder that artichokes are really just overgrown thistles! Thanks for another great post, and say hi to the boys for me! You’re having a bad hair day too, huh? But Daniel’s “do” (the Billy Idol look) is permanent. I’m glad to hear that your artichokes are doing well. I wasn’t impressed with mine: some of the seedlings turned out to be cardoons, and the heads of the artichoke types weren’t nearly as purple as the pictures. It’ll be interesting to see how yours perform next year. That was fun! 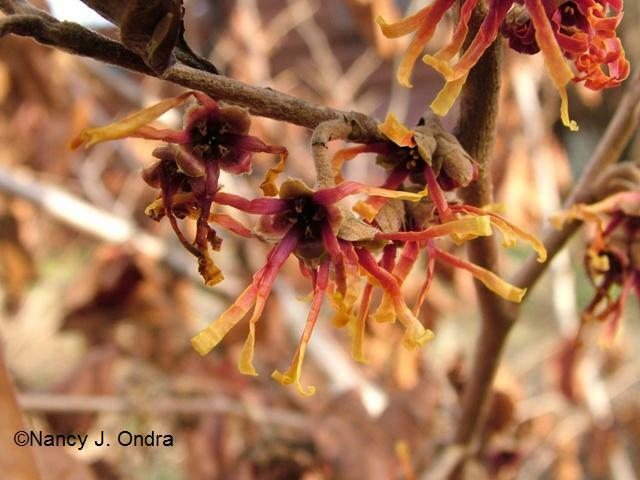 Is your Witchhazel blooming early? It’s great that your Hellebore has decided to bloom ahead of schedule. I thought I might have Christmas Roses for Christmas this year, but then the sub-zero temperatures put them on hold. The Winterberries would look great as part of an arrangement, I’d find it hard to share them with the birds. 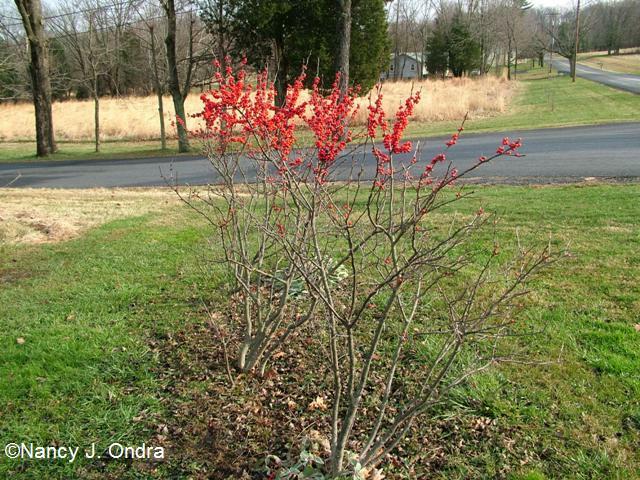 Yes, the witch hazel is way early this year – only one one branch, though. It’s also interesting that the petals have yellow in them as well as reddish purple; previous blooms have always been a solid red-purple. Hmmm…I wonder if this branch is a sport? I’ll have to keep an eye on it. It’s probably just as well that your hellebores went back to sleep; I seem to remember that you had buds even before Thanksgiving. What a nice bloom day post! 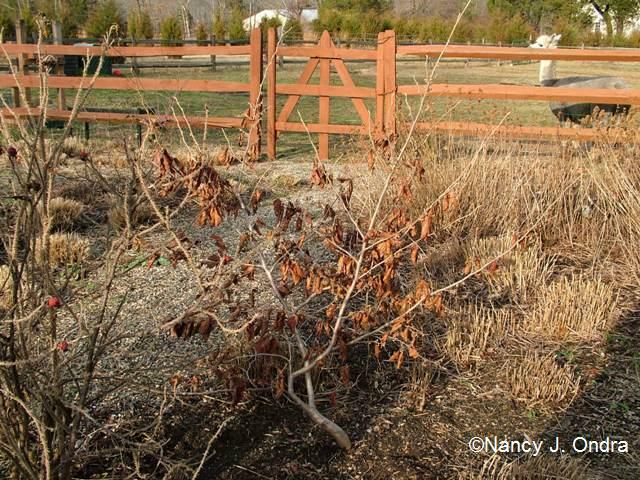 I love witch hazel but have yet to plant one… I should next spring! Witch hazels are kind of like spring bulbs for me: I adore them in the spring and wish I had more, but then I forget about planting them in the fall. I definitely encourage you to get at least one for your own garden; ‘Arnold Promise’ remains my favorite for good fragrance and sunny color too. You have quite a nice garden still going on. Most people have nothing left this time of the year. You’re very kind, Summer. I think many gardens offer *something* of interest now, but it can take some pretty creative photography to find it. Ooh, it looks cold there. 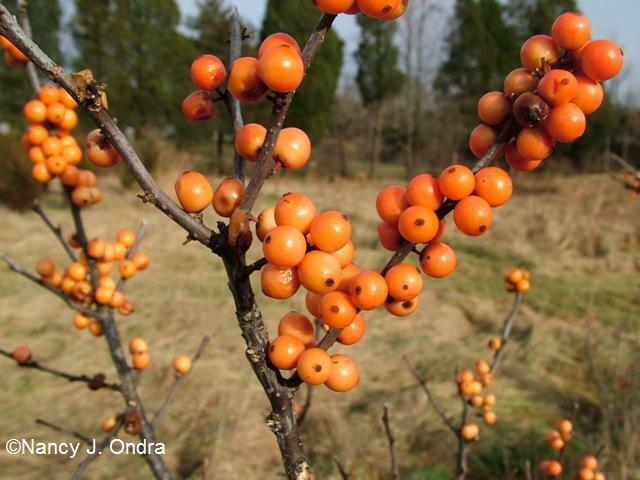 I love the berries & the yellow dogwood, both would look even prettier with a dusting of snow! It’s actually comfortable, albeit dreary, here today, but I’m almost looking forward to the return of sub-freezing weather so the mud solidifies. You’re right that a light dusting of snow would set the berries and bright stems off to advantage. Happy Bloom Day, Susie! Thanks for showing the reality behind a couple of those plants. Nice to know I’m not the only one whose witch hazel leaves cling on obscuring the flowers! Still you have lots more happening than we do. You reminded me to once again track down the word for the leaf-clinging phenomenon: marcescence. I wish I could remember that one; it comes in handy this time of year. I also like the idea of showing a closeup, and then a more distant shot. 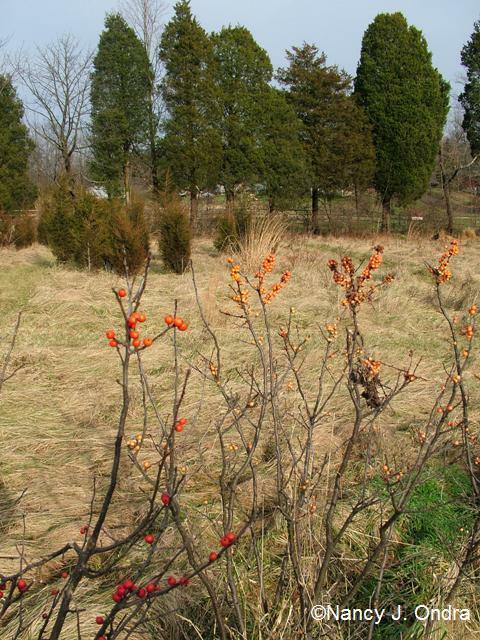 You are also showing how beautiful my garden would be if I finally got a witch hazel and yellow dogwood (which grow in my neighbor’s garden so they should grow here) and the winterberries. Spring is coming and my list is getting longer. 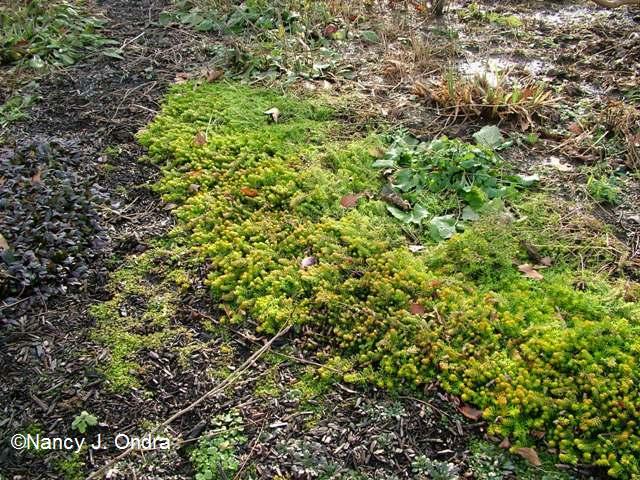 For me, it’s a lesson that it would be fun to create a winter corner with all of these plants growing in combination. 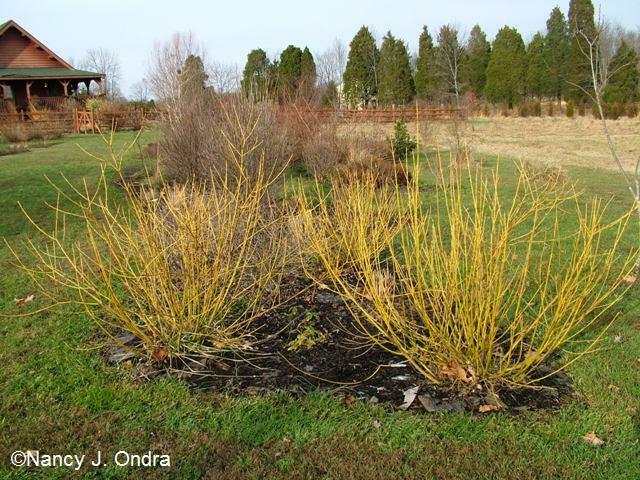 If you decide to get a yellow-twig dogwood, see if you can find ‘Silver and Gold’; its disease resistance seems just as good as ‘Bud’s Yellow’ and the stem color is bright, with the added attraction of white-variegated foliage. 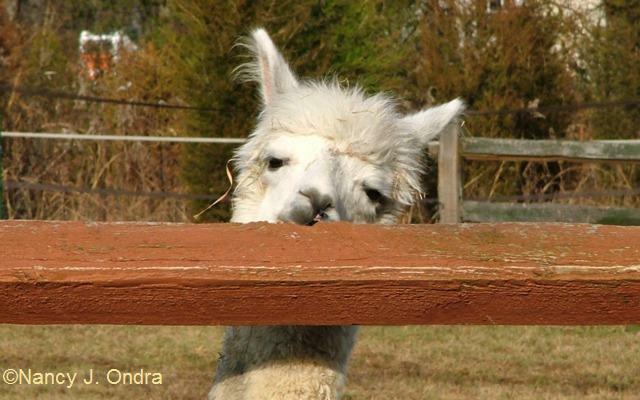 Thanks for visiting, Andrea, and for understanding the desire for closeups in the face of messy reality. Well, Kim, you could start with a little one, like I had to; it wouldn’t take up much room that way, and they seem to bloom even when they’re fairly small. What fun. 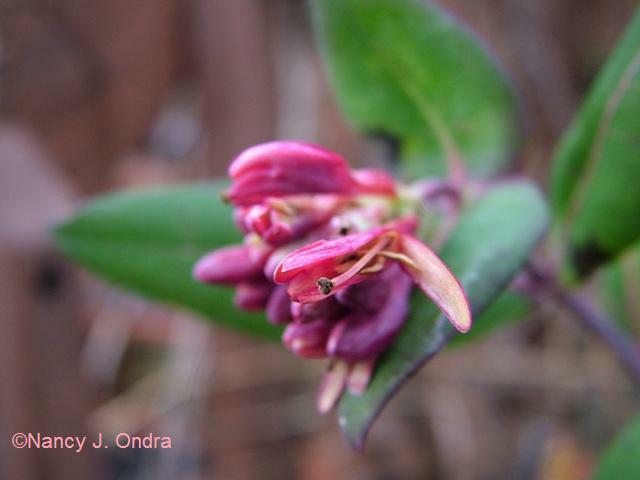 Yes, wintertime blooms always seem to look best close up! I love your boys! Yep, the close view certainly is more flattering. The boys say hello, and thanks! 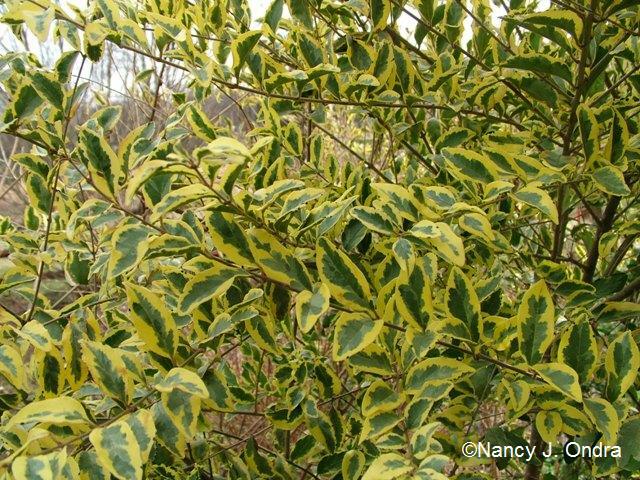 I have Cornus x “Midwinter Fire” to pick up the orange of one of the Ilex which should look nice at some point in the future . . .
Best holiday wishes to you and “the boys” and hope your 2010 is full of great gardens and beautiful blossoms . . . Thanks for checking in, Nancy. I wish I could get around to updating here more frequently, but sometimes it’s tough trying to handle two blogs. GGW was my first commitment, so it also has to be my first priority. I only post twice a month there too, but there’s a lot of behind-the-scenes stuff that also needs attention. I really like your idea of using Midwinter Fire to echo both colors of winterberry. I tried it or some other cultivar with two-color stems a few years ago, but it just didn’t thrive for me like the solid-yellow ones have. I loved your photos especially the Witch hazel. Mine looks alot like yours – its called Diane but I am sure mine was in flower this time last year – but so far its not decided to flower yet – would’nt blame it – we got our first snow fall for the winter today. You’re birds must not be as hungry as mine – if you had my birds you would not have all those delicious berries! I love the pics of your cornus. Thanks for visiting. You’re right about the similarity to ‘Diane’ in this shot. Normally ‘Washington Park’ (also known as ‘Purpurea’) is distinctly purplish pink; I’m not sure what’s up with these particular blooms. Where’s your snow? I’ve been walking through 2 foot drifts in my garden putting up chicken wire, trying to protect 12 shrubs from voracious rabbits. I can assure you that we too have snow now, though not nearly as much as you do! Oh my goodness, the boys are expressive, Nan! 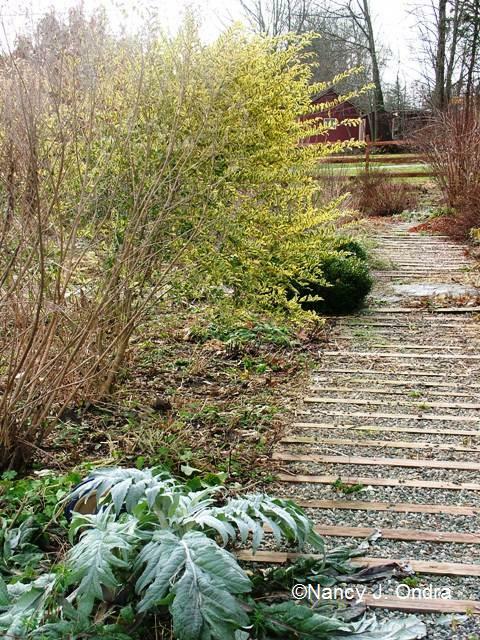 Your garden looks fabulous even in the bleakness of December. 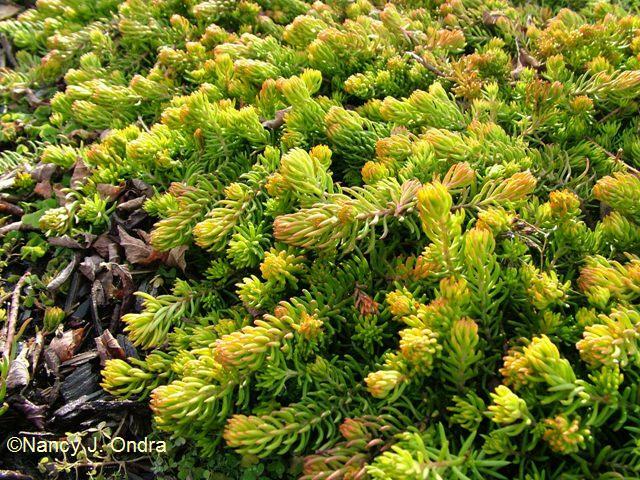 Isn’t Angelina a great sedum? She just glows all winter (when not buried in snow here, of course). 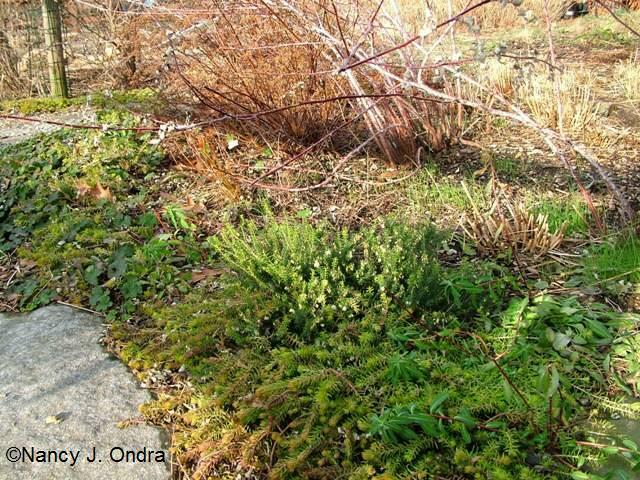 Oh yes, all these wonderful plants for winter interest aren’t very interesting under a blanket of snow. On the other hand, it covers up the mud and weeds, so maybe it’s a fair trade. It’s looking pretty “fallish” over there. What will you be doing this Winter? It’s definitely wintery here now, so I don’t have much hope for the next few Bloom Days. I resorted to fake flowers last year, but I don’t think I’d get away with that again! I wish a Merry Christman to you, your family and all your friends!! Have fun! Merry Christmas to you too, Tiziana! We seem to have more snow than you do, even now when it has been raining off and on, there are still some patches of it. My winterberries lost their male partner, so no berries for me this year. 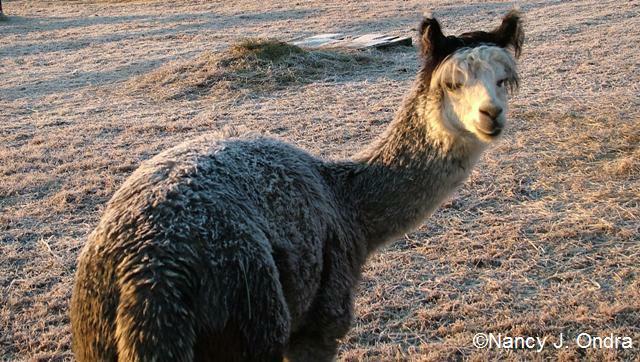 Hi Kathy – we ended up with more snow, but now it too has disappeared. We had one blissful sunny, mild day, and now we’re back in the deep freeze. I sure wish we had that snow now to protect the garden.